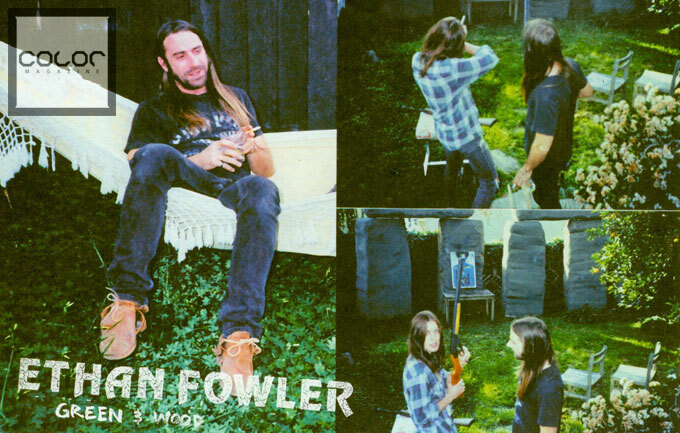 To discuss the topics of skateboarding, rock, and the overlap of the two, Color Magazine interviewed Ethan Fowler. Sauerkraut skate rock supernaut. In other words, Ethan is seriously cool. Visit colormagazine.ca for more. Every complete skateboard needs 1 deck, 2 trucks, 4 wheels, and 8 bearings. Are you seeing the mathematical pattern here? The average 608 skateboard bearing contains seven really small steel chromium balls that are secured in place by a cage system that ensures the balls roll with precision and maximize revolution speed. Master of Ollie (Ethan Fowler) was recently cross-examined at one of our favorite blogs (The Chrome Ball Incident) for his affiliation with the aforementioned skateboard apparatus. The Foundation of Stereo Television, Ethan Fowler’s skills is foul! This Friday, April 2nd is the opening party for a new art show featuring the work of Gareth Stehr. 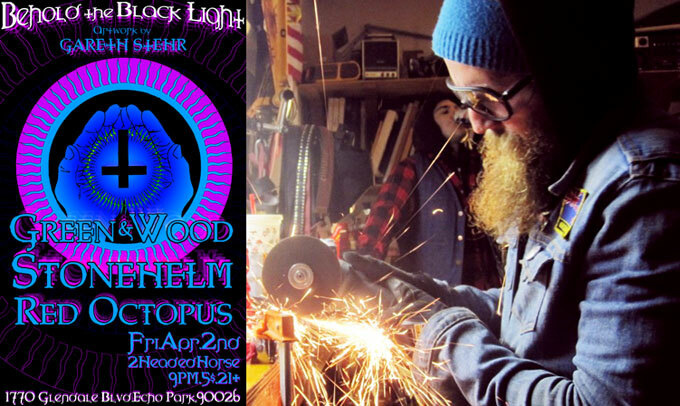 Behold The Black Light will be somewhat of an antiexhibit backed by the zounds of Green & Wood and others. Regardless of your affinity for stoner doom rock, you’ll want to attend. SXSW is out, TDM is in. Ethan Fowler’s musical project Green & Wood was one of many great bands to provide the epic accompaniment to the Converse X Thrasher Texas Death Match 2010 skate jam. Witness the nauseating effects of heat combined with moonshine and skating on what appears to be a near-perfect mini. Converse doesn’t mess around when they provide the aggro apparatus. Head over to ThrasherMagazine.com for more coverage. 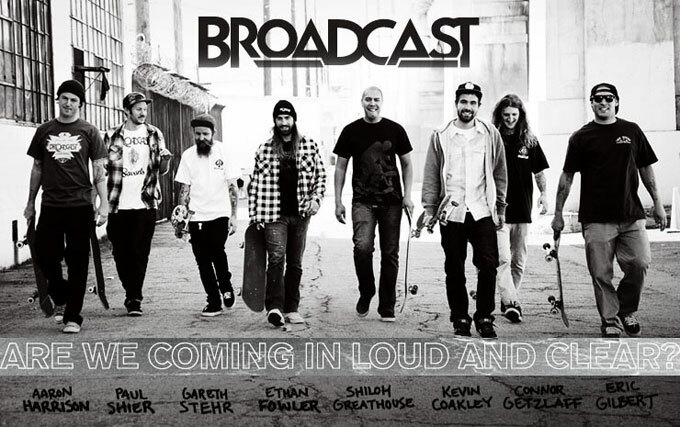 In case you haven’t noticed, there is an ever-growing tribe of talented skaters choosing to roll with Broadcast. Most recently we have added Patrick Melcher, Jeremy Holmes, Nolan Johnson, and Billy Davenport to the team. Why have these guys decided to support Broadcast and what is their urethane of choice? Ask them yourself. Are We Coming in Loud & Clear? 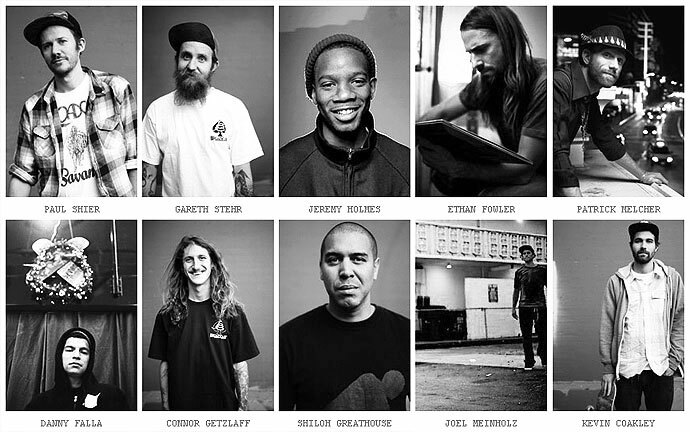 Broadcast Wheels is pleased to formally announce the launch of the Broadcast skateboarding brand and welcome our team of truly talented individuals. With the help of pro skateboarders Ethan Fowler, Paul Shier, Shiloh Greathouse, Gareth Stehr, Danny Falla, Aaron Harrison, Joel Meinholz, Eric Gilbert, Kevin Coakley, and Connor Getzlaff, Broadcast Wheel Company has developed a premium street and park urethane formula that is the direct result of feedback and testing from droves of skaters who were disappointed with the mediocre wheels that were currently available from other brands. Our small product line will always remain tight and top-quality while we continue to add new products and styles. Keep your eyes & ears open for further team additions and product announcements next month. For more information, please visit www.THISISABROADCAST.com or follow BroadcastSkate on Twitter. Here is the first look at the new product offering from Broadcast. 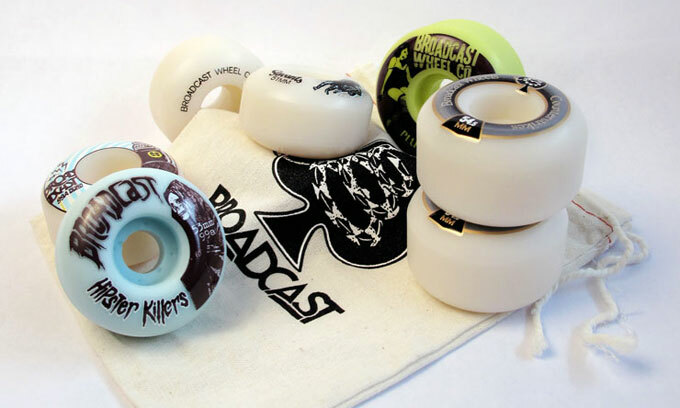 The 2010 catalog consists of a range of premium American urethane wheels and a small line of basic skate apparel. I must divulge that the wheels are mighty perfect: everyone has been approving them as the best wheels they’ve ever skated. Straight from the horses mouth. Special thanks to all those who have been involved in the launch of this brand: Jon Dragonette Photography, French, Jarrod Bryan Design, Dustin Desmarais Design, Distrikt Collective, Jer Wood, Prestige, SCS, Eric Wall, Geoff Scofield, team riders Paul Shier, Ethan Fowler, Gareth Stehr, Kevin Coakley, Joel Meinholz, Patrick Melcher, Danny Falla, Aaron Harrison, Shiloh Greathouse, Eric Gilbert, Connor Getzlaff, the Boise and San Clemente Crews and anyone else we forgot.